Active Motion Interceptors Ride Control System for High Speed Vessels Naiad Dynamics, the world leader in marine motion control solutions, introduces the Motion Interceptor Ride Control System: a low cost, low power consumption, low weight ride control system for high speed (20 to 60 knot) vessels from 10 to 100+ meters (30 to 300+ ft.). The system provides roll and pitch control, and continuously optimizes running attitude for improved speed, better fuel economy and extended range. 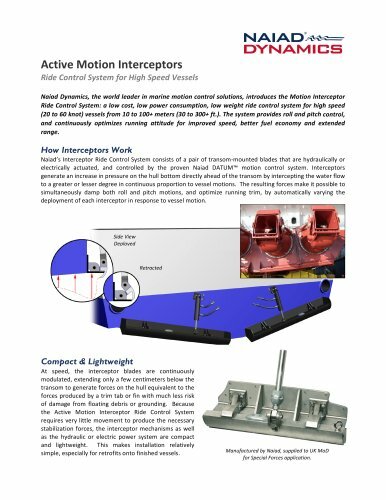 How Interceptors Work Naiad’s Interceptor Ride Control System consists of a pair of transom‐mounted blades that are hydraulically or electrically actuated, and controlled by the proven Naiad DATUM™ motion control system. Interceptors generate an increase in pressure on the hull bottom directly ahead of the transom by intercepting the water flow to a greater or lesser degree in continuous proportion to vessel motions. The resulting forces make it possible to simultaneously damp both roll and pitch motions, and optimize running trim, by automatically varying the deployment of each interceptor in response to vessel motion. Side View Deployed Retracted Compact & Lightweight At speed, the interceptor blades are continuously modulated, extending only a few centimeters below the transom to generate forces on the hull equivalent to the forces produced by a trim tab or fin with much less risk of damage from floating debris or grounding. Because the Active Motion Interceptor Ride Control System requires very little movement to produce the necessary stabilization forces, the interceptor mechanisms as well as the hydraulic or electric power system are compact and lightweight. This makes installation relatively simple, especially for retrofits onto finished vessels. Manufactured by Naiad, supplied to UK MoD for Special Forces application.